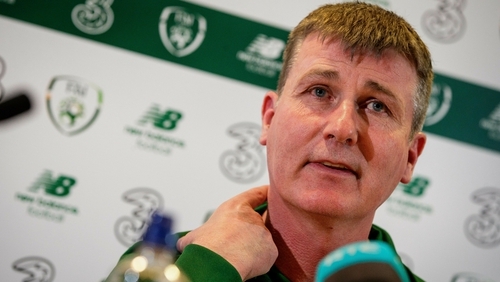 Stephen Kenny is well aware of the difficult task he faces as the new Ireland Under-21 manager continues his preparation for the upcoming 2021 Euro qualifying campaign. The former Dundalk manager was appointed as Under-21 manager in November, with a view to taking over the senior role from Mick McCarthy in the summer of 2020. But Kenny is not looking beyond his current remit, which is to take the underage side through the upcoming qualifying campaign. The Boys in Green were fourth seeds going into the draw for the 2021 tournament, and have been handed a suitably daunting assignment, placed in a group alongside perennial contenders Italy, Sweden and Iceland, as well as Armenia and Luxembourg. And while such a selection may be deemed quite palatable at senior level, with the top two qualifying for the tournament, things are not so straightforward at Under-21 level. "A top two finish does not get you through," explained Kenny, speaking to the media at FAI headquarters on Thursday. "There are only 12 teams to qualify. Nine group winners, the two hosts, Slovenia and Hungary and just one second place finish between the nine groups. "It is extremely difficult to qualify. And we have never qualified at this level in the 40 years of its existence." And while the task is, without doubt a challenging one, it is also one that the fledgling international manager is relishing. The campaign gets underway in March as Ireland take on Luxembourg in what is the only game of the group, which kicks off, in essence, after the summer. A chance to steal a march on the group members, and a chance to get some points on the board, pondered Kenny. "We have got a very tough group with Italy, Sweden and Iceland and we are the fourth seeds. "So I think we need to be absolutely positive with our approach. Take the first game against Luxembourg, try and be very positive and try and blood the players that we feel deserve an opportunity and give themselves a chance to do well in the campaign. "We are the only team with a game in March so we have a chance to try to win a game and get a chance to put points on the board before anyone else can." Kenny noted how strong Italy and Sweden tend to be at Under-21 level, traditionally containing many players who play in their respective top tiers. Italy have won the actual tournament five times since 1992, while Sweden won the 2015 edition, beating Italy en route to the final, where they overcame Portugal on penalties. Ireland, on the other hand, have an atrocious record at this level and things may not be getting any better anytime soon as very few players are playing at first-team level over in the English leagues. "When you play Sweden, they will have a lot of players playing with Swedish Premier Division clubs and likewise with the Italian teams, they will have players playing in the Serie A. "There are very few players playing with any first team in England. Dara O’Shea is on loan at Exeter from West Brom and Canice Carroll has jsut gone on load to Swindon. "Obviously, Michael Obafemi had a brief spell with Southampton but that is it at the moment." But that won’t stop Kenny from keeping things positive throughout the qualifiers, and the manager is still planning to go out and win any game that they can. "We are playing to win games. We don’t have an inferiority complex. We will certainly be trying to win all the games that we can. "I’m only getting to know the players now, having watched various Under-23 games in England over the last few weeks and just getting a picture of who is available. "There is a wider remit of players developing and getting an opportunity to try to become full internationals in the future." And while Kenny was reluctant to look beyond this campaign and on to the summer of 2020 when he is set to take over from McCarthy, he does believe that the upcoming campaign will prove the perfect springboard for any player showing form, being called up to the senior side, as well as gathering vital experience at Under-21 level. "It is an opportunity to win matches in the Under-21 campaign, and while doing so, and if you are playing well and producing good performances, it is an opportunity to put yourself really in the frame for the first team and that is the objective."